New in 2018, the Wingate Yurts expand our more glamorous nighttime accommodations to a location closer to all the action. Maintaining our standard of amazing views, these sites allow more convenient access to our Dead Horse Point Rim Hiking Trails, the Visitor Center and loved ones staying in the campgrounds. Each yurt contains sleeping space for up to six people, in the form of a queen on bottom and full on top bunk bed plus a pullout futon couch. An outdoor propane grill allows for cooking on site and the park provides the propane. Heating, air conditioning, and electrical outlets are available, and tables are available both inside and outside of the yurt. Modern restroom facilities are located within easy walking distance. Bedding is not provided. Door Code: The code to your yurt will be listed on your email confirmation. If you do not get an email with the code please contact the park between the hours of 9:00 AM and 5:00 PM. Dead Horse Point does not have a natural water source. Please conserve water while staying at the yurts. The spigots should be used for drinking, cooking and cleaning, please do not play with the water or use it for bathing. Fires are permitted in the established fire pits of the park; however, wood can not be gathered from the environment. Bundles of wood are sold at the Visitor Center and Entrance Station or in Moab. Bring your own camp chairs to enjoy your fire. Help us out by keeping your yurt clean. Please sweep the floor before you leave and cleaning spray and rags are available to wipe up any spills. Cooking must be done outside and no open flames are allowed in the yurts. Gas grills are provided for cooking use. Keep indoor furniture indoors. Take your trash to the dumpsters by the dump station as you leave. Heating and cooling units exist in each yurt. Please turn them off upon departure. Trash collection is costly at the park. Please consolidate and compact trash before putting it in our dumpsters or take it with you to a town. Pets are not allowed within the yurts. Pets must also be attended to at all times while in the park so they can not be left in cars or leashed outside the yurts. If you know someone staying in a Wingate or Kayenta campsite with a pet, remember that the pet can not visit the yurt. 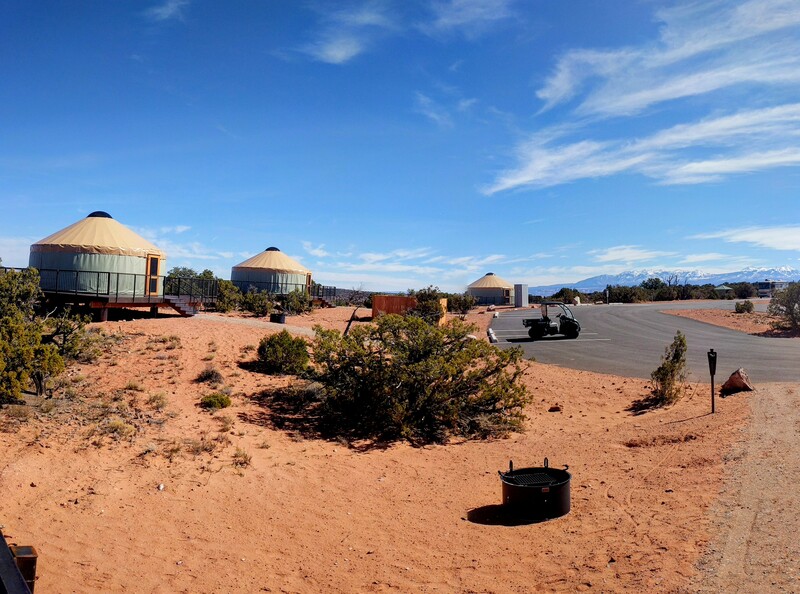 If you would like to spend the night in the park with your furry friend, consider the Wingate or Kayenta Campgrounds. Dogs that meet the ADA definition of service animal are welcome in the yurts. You may be asked by park staff if your dog is required because of a disability, and/or, what task your dog has been trained to perform according to the ADA compliance requirements. The ADA does not recognize emotional support animals and a doctor’s letter does not give an emotional support animal public access rights. For more information click here. If you are a customer with allergies to dogs please be advised that there is a possibility that service dogs have been present in the parks yurts. To make a camping reservation, contact Reserve America at 1-800-322-3770, or visit www.reserveamerica.com.